Knit Up & Dye Podcast, Yarn & Knitting Patterns: Christmas Knitting Officially Finished. I'm officially finished with my Christmas knitting, and honestly amazed it's still December (I've been know to give I.O.U. 's for knitted items). I love giving handknit items, but I never give myself enough time to actually knit them, and so here it is that I set one of my New Year's Resolutions. In 2011, I resolve to begin my Christmas knitting in January, and work to complete all gift projects before Thanksgiving, allowing time not only to ship affordably, but to sneak in last minute projects. 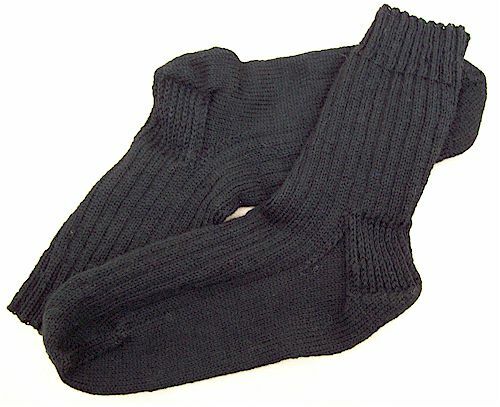 My very last project was these socks, made of Paton's Kroy Socks yarn in "Coal". The pattern was "Mr. Pitt's Socks" by Kaitlyn Wong. The pattern is available for free on Ravelry. The recipient of these socks has tried them on and declared them a wonderful fit and very warm. He will be wearing them proudly Christmas morning. Thank you Kaitlyn for a fantasic pattern! I love how you came to name them.